Alvaro Morata and James Rodriguez scored twice as a much-changed Real Madrid moved to within three victories of winning La Liga with a 4-0 demolition of Tony Adams’s already-relegated Granada. Earlier, Neymar, Lionel Messi and Luis Suarez were all on target to take their combined tally for the season to 102 as Barcelona kept pace at the top with a 4-1 win over Villarreal. Barca remain top thanks to their superior head-to-head record with the two locked on 84 points, but Real have three games remaining to the Catalans’ two. Real coach Zinedine Zidane continued his rotation policy of recent weeks with nine changes from the side that beat Atletico Madrid 3-0 in the first leg of their Champions League semi-final on Tuesday as hat-trick hero Cristiano Ronaldo was left out of the squad entirely. However, it mattered little as Real maintained their perfect La Liga record in nine games without Ronaldo this season. “For a coach it is the best possible news,” said Zidane. 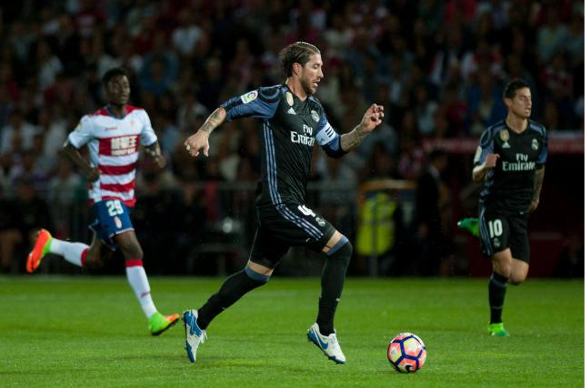 Barely two minutes had gone when Lucas Vazquez got in behind the Granada defence and squared for Rodriguez to tap home the opener. The Colombian then powered home a header from Fabio Coentrao’s cross just nine minutes later. Adams made a substitution after just 16 minutes as Uche Agbo replaced Aly Malle, but it couldn’t prevent the one-way traffic. “Real Madrid are at another level to us, they’ve got some fantastic players but we gave it to them too easily in the first-half,” said Adams. Morata blasted home Danilo’s low cross then bullied Martin Hongla out of the way to fire home his 20th goal of the season. Vazquez then hit the bar and Casemiro somehow shot over with the goal at his mercy as Madrid’s dominance of the first 45 minutes left some Granada fans in tears. Real had mercy on the hosts after the break, but now just need seven points from their last three games against Sevilla, Celta Vigo and Malaga to seal a first La Liga title in five years. Barca maintained the pressure on the European champions with all of their front three on top form against Villarreal. Neymar took advantage of a blocked shot from Messi to prod home the opener from close range after 21 minutes. However, Villarreal striker Cedric Bakambu continued his brilliant form to bring the visitors levels just 11 minutes later when he streaked clear of Gerard Pique before slotting home his seventh goal in six games. Barca got a slice of luck to regain the lead just before the break as Messi’s effort from the edge of the area deflected beyond Andres Fernandez for the Argentine’s 50th goal of the season and to bring up a combined 100 for he, Suarez and Neymar for the campaign. Suarez took that tally to 101 and killed the game off as a contest when he turned Jaume Costa and fired low and hard past Fernandez. Costa was also the man at fault as he was harshly adjudged to have handled inside his own box after a sensational piece of skill from Neymar eight minutes from time. “Any football fan should value what Neymar does,” said Barca coach Luis Enrique. And Messi chipped the resulting penalty down the middle of the goal to round off the scoring. Atletico guaranteed a top-four finish as Saul Niguez’s winner 21 minutes from time earned a 1-0 win over Eibar. At the other end of the table Sporting Gijon kept their hopes of staying up alive with a 1-0 win over Las Palmas.